The Bath & Kitchen Gallery is a new addition to UNITED PLUMBING SUPPLY, Inc. of Springfield, Massachusetts, a locally owned and operated business for over 60 years. 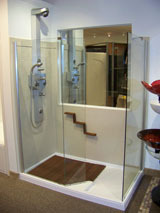 We are a Premier Showroom offering an extensive mix of bath and kitchen fixtures . We have a knowledgeable and friendly staff willing to guide you through the vast array of products to select items that truly fit your project. Our inviting showroom features premier fixtures from KOHLER, California Faucet, Grohe, Delta, Moen and Symmons for water delivery.